For larger quantities see "Bulk Prices" menu below. Recorded during the 2003 Avatar Professional Course, Harry Palmer's talk addresses the spiritual questions we each encounter - Who am I? What is happening? Why am I here? Along the way, Harry describes his encounter with the green-robed guru, explains the three precious jewels of Buddhism, shows how to avoid the pitfalls of personal ego, touches upon the three steps to enlightenment, and shares his relationship with the person in the two-way intergalactic alternate reality transmitter. Within this fun, lighthearted talk, you'll find there are many levels of answers to these questions. And what becomes evident is that the path to enlightenment is not so elusive after all. "The first discovery that you make as a Wizard is that your life is not really about any of the things people tell you that it ought to be about. You awaken beyond indoctrination. And if you think your life is meaningless it only means that you didn’t understand what I just said. Your life is really not about any of the things that people tell you that it ought to be about. Now what is the one single ingredient that makes your life meaningful? Just this, your life is unique. It’s one of a kind. There are lives that only you touch, and there are choices that only you get to make. Your unique life is your personal unique opportunity for enlightenment. You notice I didn’t say your life is a guarantee of enlightenment -- it’s an opportunity. And your fate is made by the choices you make. And if you don’t believe me, that’s one of the choices you make. I’m only here to remind you that your life is an opportunity for enlightenment, and that enlightenment is more valuable than any impermanent thing." 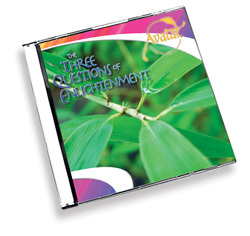 Bulk pricing is available for this CD. Type the quantity you want in the shopping cart, click Recalculate and the discounts below will automatically be applied. Click here for more information about The Avatar Course!